Dear Readers, most of the flowers of early spring are rather delicate, pastel-coloured plants, subtle and self-effacing. 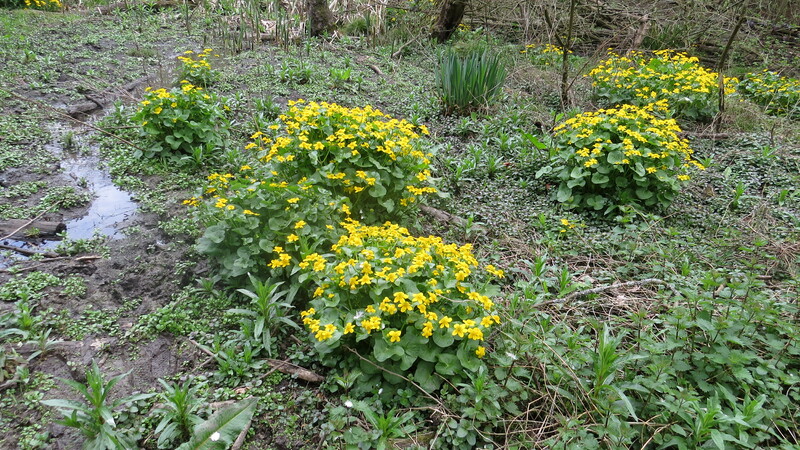 Well, this could never be said of the Marsh Marigold, which has burst forth across the muddy riverbeds of the Everglades in Coldfall Wood like a positive wash of sunshine. 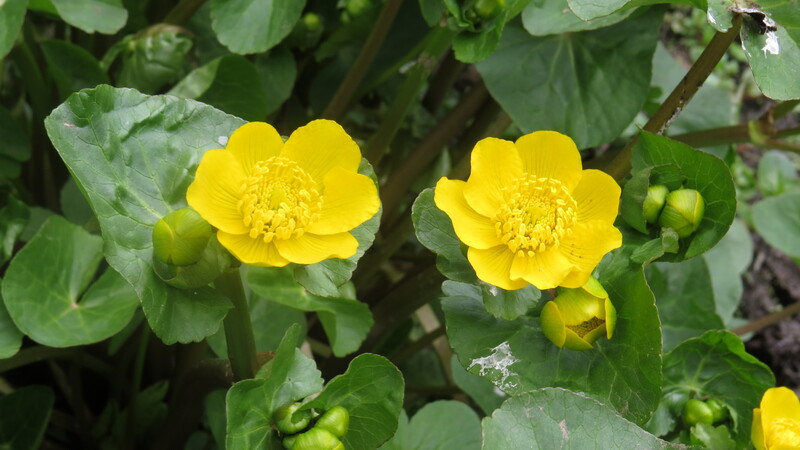 Also known as Kingcup, Marsh Marigold is not a marigold at all – the name comes from Mary Gold, and refers to its use in medieval churches as a tribute to the Virgin Mary – but a buttercup. And what a buttercup! I love the slight shininess of the petals, the exuberance of the gently-opening stamen, and the way that hoverflies seem to fall onto them in a positive swoon of appreciation for their generosity. Although you might think that its sheer tropical boldness implies that this plant hales from warmer climes, it is in fact one of the most ancient of our native plants – Richard Mabey speaks of how, unlike most flowering plants, it survived the glaciations of the last ice age, and flourished in the marshy meltwaters. Its longevity as part of the plant community of these islands is reflected in its wide variety of vernacular names: Mayblobs, Mollyblobs, Water-blobs and, my personal favourite, The Publican. I guess that these names reflect the solidity of the plant, and the sense of hospitality that comes with the abundance of bright flowers. Once, when there were more meadows and cattle wallows, this plant must have been by far the boldest and most obvious sign that spring had finally come, more so than the delicate primroses and lesser celandine and wood anemones. It is like a great trumpet-blast of optimism wherever it grows. The plant has a special place in the hearts of the citizens of the Isle of Man, where many plant rituals survived for much longer than in mainland Britain. Marsh Marigolds were strewn on doorsteps on May Eve, and it is brought into the house as a symbol of spring, and as a way of blessing the house. 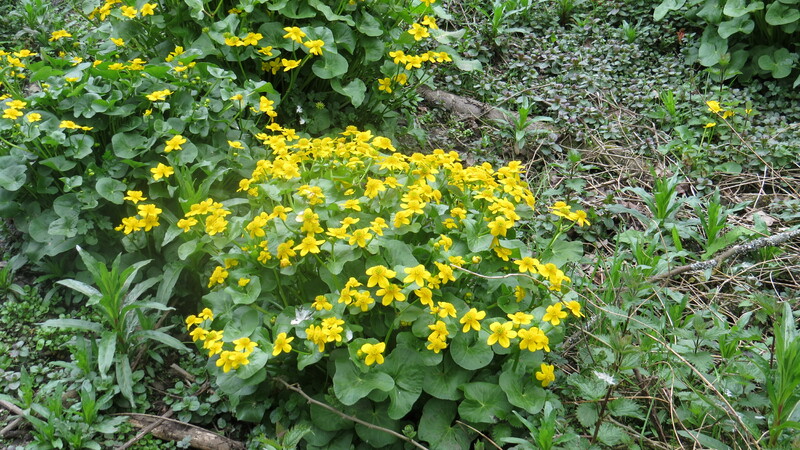 In England, there was also a belief that it was protective against malignant fairies and other little folk of bad intent, and Marsh Marigolds would be picked on the evening of 30th April and dropped through every letter box to dissuade the fey folk from any mischief. 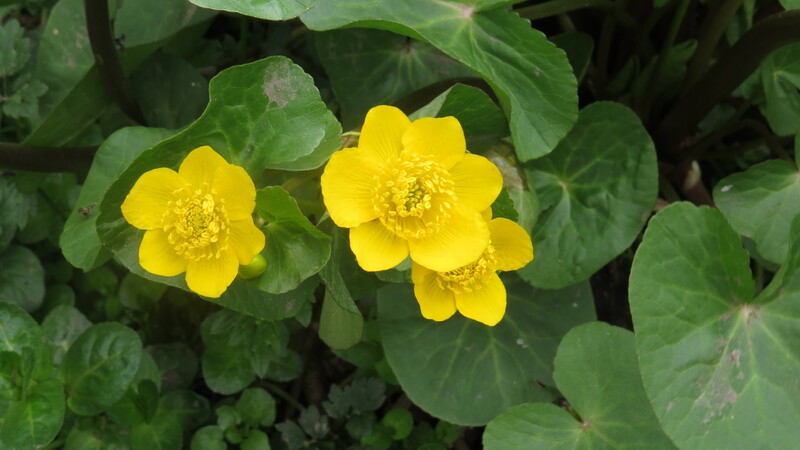 Cattle were also garlanded in Marsh Marigolds as a protection against the evil eye, even though it is actually poisonous to cattle. 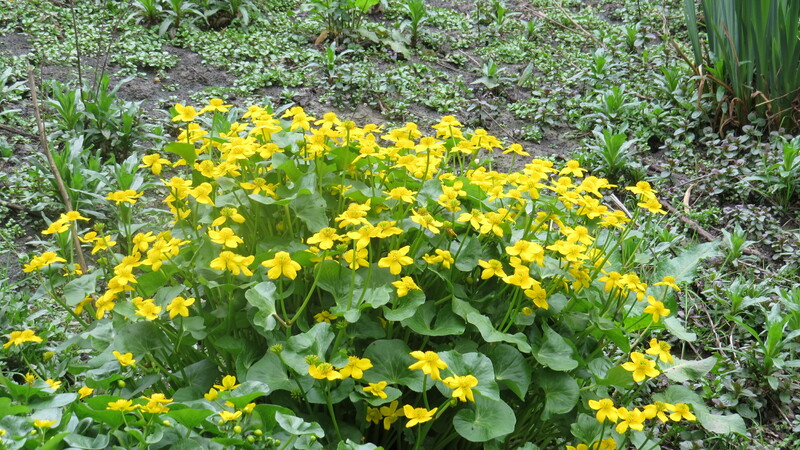 In Latvia, Marsh Marigold is known as Gundega, a word that means ‘burning fire’. This is presumably because of the dermatitis that can be caused by handling the plant – like all buttercups, some people have an adverse reaction to its sap. 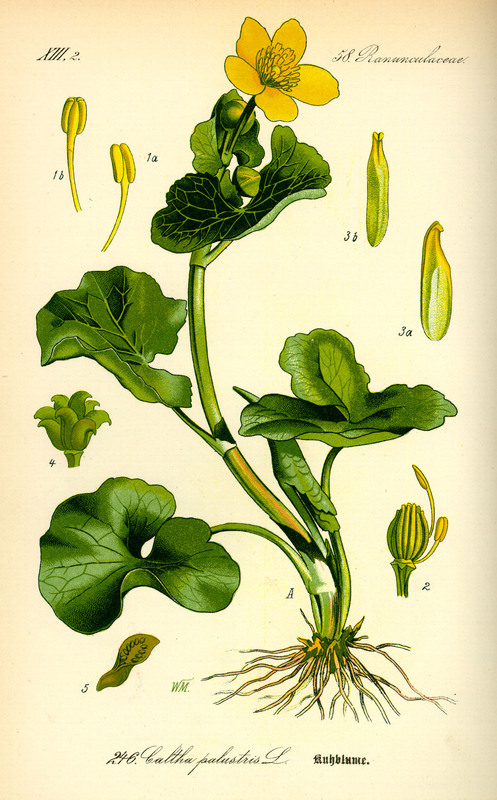 In spite of this, it has had some culinary uses – Queen Victoria is said to have enjoyed boiled mutton with ‘capers-with-a-difference’, the difference being that the ‘capers’ were the buds of Marsh Marigold. To confuse matters somewhat, in North America, where the plant is native in the north-east, it is sometimes known as Cowslip, and the leaves were cooked by early settlers as a vegetable, in spite of the plant’s poisonous nature. The Iroquois also used this plant as an antidote to someone who had imbibed a love potion. My source, the ‘Plant Lives‘ website, states that it seemed to make the lovestruck swain ‘very sick’. I suspect this would rather have taken the shine off of any passionate feelings that they might have been developing. 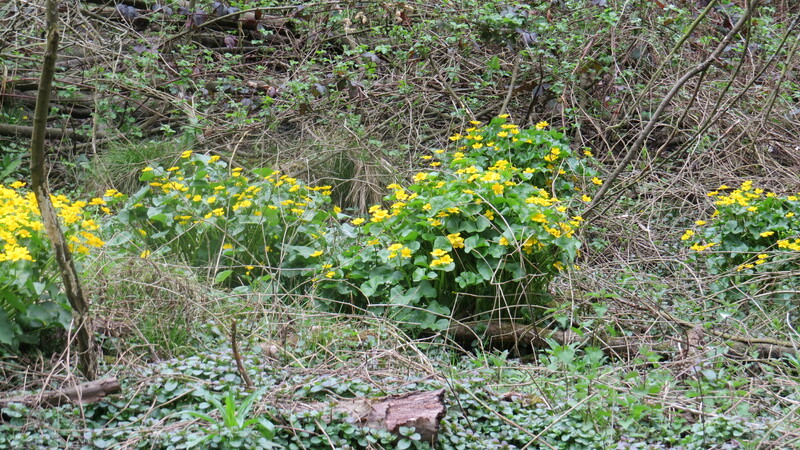 What is particularly magical to me about Marsh Marigold is the way that, after flowering, it completely disappears. I have one in my pond, and every year I am anxious in case it doesn’t grow, so complete is its vanishing act. And then, in just a few weeks, the juicy green leaves appear, followed by the fat round buds, and eventually the butter-coloured flowers. Of course, this is the way of many plants, but it is the one that I am always most relieved to see. It feels as if, on some level, the great pulse of the world is still working. This entry was posted in London Plants on April 22, 2015 by Bug Woman. What a magical plant! So rich in history with its lovely yellow flowers. The botanical print is beautiful. Thank you for bring spring and good cheer to my Wednesday! You’re welcome, Laurin – your blog does the same for me. I’m learning so much about gardening in a climate that’s completely different from the UK via your garden designs. I do look forward to your Wednesday Weed posts. I’ve learned a lot from them, as well as the pleasure that I get. Thank you. Hi Gail, I’m so glad you enjoy the blog – I’m learning a lot too!